Installed in Santiago, Chile was the nature inspired temporary pavilion ‘Water Cathedral’. This design by the Chilean-German group, GUN Architects, was the winning proposal for the MoMA young architects program international. The thin, vertical elements mimic stalactites and stalagmites, which are found in caves. 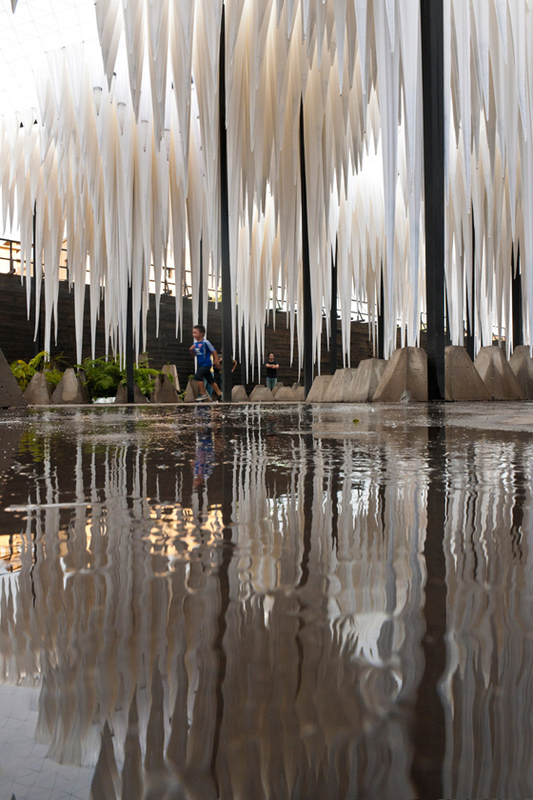 And, just as in a cave, the atmosphere created by the installation creates a cooling sanctuary from the city’s powerful summer heat. The vertical shapes are suspended in various heights and densities from a minimalist steel framework. The variation adds visual interest while allowing visitors to walk and sit within the space. Incorporated into the design is a hydraulic irrigation network. The water collected evaporates and cools the surroundings. As the shapes are filled with small amounts of water, they act as interfaces from which water droplets gradually flow and cool visitors below.